Weld County Sheriff's Office Deputy and Colorado IX member Sam Brownlee was shot and killed while attempting to capture a suspect following a high-speed chase. A deputy from neighboring Morgan County and a Wiggins police officer attempted to stop the suspect after identifying the suspect's vehicle in relation to an earlier domestic violence case. The suspect refused to yield and led officers from multiple agencies on a high-speed chase across Morgan and Weld counties. The pursuit at times exceeded 100 miles per hour before stop sticks were deployed, successfully disabling the vehicle in a residential area of Evans. The suspect attempted an escape and a struggle ensued between the suspect, Deputy Brownlee, and several officers. The suspect was able to gain Deputy Brownlee's service weapon and shot Deputy Brownlee three times. The suspect was shot by other officers at the scene and died later at a nearby medical center. Deputy Brownlee had served with the Weld County Sheriff's Office for five years. He is survived by his wife, two children, and two stepchildren. Tim Sharp was a charter member of Blue Knights® Colorado IX. Tim took on the duties of Quartermaster and helped out in many ways with the chapter and its events. In January of 2000, Tim was diagnosed with leukemia. 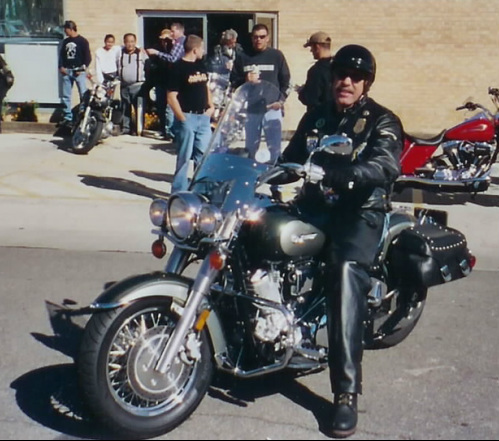 While he was no longer able to pursue the love for his career in law enforcement, he did continue to follow his passion for motorcycling and enjoying the fellowship provided by the Blue Knights®. On November 24, 2007, Tim succumbed to his battle with leukemia. Kent Donahue worked for the Greeley Police Department for 27 years before becoming the Chief of the Silverthorne Police Department in August of 2004. Kent suffered a fatal heart attack on May 29, 2005, after returning from a trip to California.